Good day duelists! Welcome back to The Scoop! The absolute realest Yu-Gi-Oh! News Report on the internet, and of course it's right here on ARG! This upcoming weekend is the pinnacle of competitive Yu-Gi-Oh! for the year! The players that have qualified for the ARG Circuit Series 25k Championship are slowly making their way to Philadelphia in order to claim their shot at both Players Champion and ARGCS Champion, and a shot at some fantastic prizes! The players that qualified for the World Championships have made their way to Japan and are preparing to battle it out for the illustrious title of World Champion! Among the players that have traveled to Japan is America's very own Noah Greene! 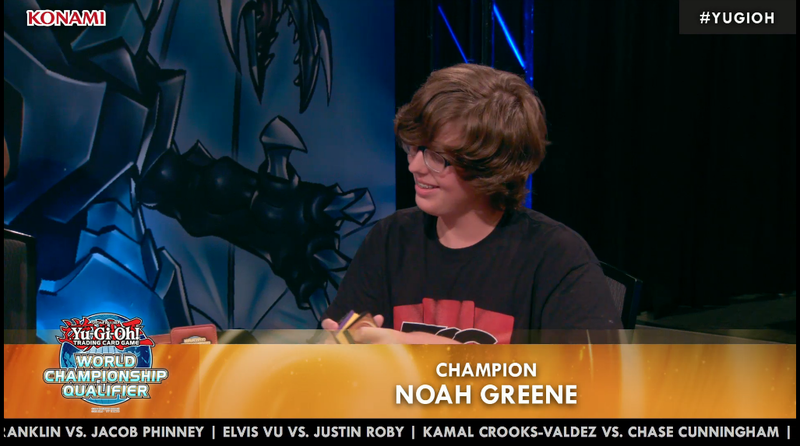 Noah comes from Atlanta, Georgia(relatively speaking) and is the third consecutive player from the local card shop, Super Games, that has won the North American World Championship Qualifier; with the other two being Patrick Hoban and Korey McDuffie. I had the opportunity to sit down with young Noah and talk about some of the experiences he's had since winning the WCQ and some of the excitement that's building up as he makes his way to Japan to attempt to become the first World Champion from the United States. As you'll see in the interview, Noah has received some great reception from his peers and is very excited about the opportunity he's earned for himself. Without further ado, here's my sit-down with Noah Greene! So I've got to know, how did it feel to Win nationals? It was absolutely surreal! It's hard to put into words how it felt. It was the kind of feeling where you just kept waiting to wake up. I'd imagine so! It's the dream of most duelists to make it to that mountaintop. But for those who at least come close, the dream is to go to the World Championships, right? Tell me, at the point where you realized you'd be going to Japan for worlds, what was your reaction? I was just incredibly happy. In top 4, Maxwell Schrack and I played the whole match laughing and smiling. At that point we were both just ecstatic to have made it all the way. Yeah I saw that! You two seemed like you almost didn't even care about the outcome, but we all know that's not exactly the case! How has the reception been since nationals? Have more experienced players taken you under their wing in order to "train" you for Worlds? If so, who and what's the best pieces of advice you've gotten? Reception has been very good since I won. Mostly everyone that I have seen since nats has taken kindly to me. And yes, absolutely! Everyone has been so very willing to help out! Desmond Johnson, for one, has been a huge help. He told me to play every game with all cards revealed. From that method of playtesting, you get so much more than you would normally get. It drastically improves your ability to make accurate reads on what your opponent has, and teaches you to play around generally unknown cards. That's fantastic. I'm actually quite thrilled to hear that you took advice from Desmond, of all people! But you're heading off in a few days, Noah, and there will be some very stiff competition at Worlds this year. It may not be the most stacked list of competitors, but there are definitely some high level players in the fray. What person or country do you think the biggest competition is coming from this year? I can’t say for sure because I'm not completely familiar with all of the competitors this year, but I know that Galileo De Obaldia is an amazing player, as you've said yourself, and that he will be in attendance this year. I really would like to learn a bit from him, being that he's been to this place two times previously and won the whole thing once. Oh yeah, he's absolutely one of the greatest to do it! The first runner-up from last year, Hiyama Shunsuke, will also be in attendance, and anyone who knows about his presence in Yu-Gi-Oh! knows that he's a very innovative deckbuilder and always comes to the table with something new and crazy. With that being said, what are you expecting to see on the tables this weekend? Hey you've got a whole country behind your back so no matter what you're up against, we'll be rooting for you! So we all know you've been testing non-stop trying to get the perfect concoction and whatnot. What all have you tested in the lab leading up to this event? The decks that I have spent the most time playing with have been Ritual Beast, Satellars, and Qliphort. Ritual Beast I found to be the most powerful in terms of sheer capabilities, but extremely inconsistent and I don't know if I can deal with that. Satellars I found were consistent, but way too fair as far as what they could do, so that's thrown me off as well. Qliphorts, I found, were a great balance of strength and consistency, but the deck loses very hard to spell and trap removal, especially games 2 and 3 which will be the majority of games played. I'm not sure I'd pilot a deck that's only going to be great for one game and lose hard the other two. Well the assessments of those three decks have always been about the same. The Worlds list definitely didn't do much to change the overall structure of the deck. Speaking of it, what did you think about the Worlds Exclusive Forbidden and Limited List? Did anything stand out immediately when you saw it? I’m honestly not a fan of it, but that may just be my biased opinion because it doesn’t reflect the TCG meta. I know it's not supposed to, and that it reflects the OCG as well as the TCG, but it takes me out of my comfort zone a bit. I'm fine with that, though. The only thing that really caught my attention aside from that was that CORE would not be legal. Yeah, the Worlds list is always one of much consideration. You have to examine it closely and it DOES take you out of your comfort zone and forces you to be a little different and think on a much more broad spectrum. It's a good test for duelists who make it to this level, though, because in theory, you should be expected to think this way at this level of play. So aside from decks and all that, what are you most excited for this coming weekend? More than anything I’m just very excited to be able to represent the country at the most important event of the year! I really look forward to seeing Japan because I never thought I'd get to just take off to a country like this. It's a very surreal feeling, all of this. Absolutely, Noah! And we're all excited and happy to have you representing the country and the Continent for sure. So you've gone through a lot since winning the WCQ and now taking off to Japan. Between that time and now, what's been your favorite part about this whole process; this whole experience? It definitely has to be all of the new people that I have met and all of the new friends that I have made. I'm much more than thankful for everyone that has been a part of it, and thank you for the interview! No, thank you for being willing to participate! I always try to bring interesting and great players to the light, and I don't believe you've received enough credit since your victory. I just want you to know that regardless of everything, we're behind you as a player, a representative, and a person! The community got to see a little bit more of you today, and to know that you're a very humble individual with a good outlook on the game and the will to continue to get better is comforting for the people that want to see someone genuinely in love with the game take home the title. Great talking to you, Noah! Alright! That's it for The Scoop for the week ladies and gents! I thank you all once again for checking out my sit-down with Noah Greene! As always, if you have news you'd like to see investigated or people you'd like to see interviewed, drop it in the comments and I'll make my absolute best efforts to bring it all right here to you! Until next time, as long as there is a next time, Play Hard or Go Home! !